Major C.C. Gwyn, on of the most popular and efficient of Officers was killed by a M.G. bullet, about 100 yards from the objective and Lieut. W.J. McLean was also killed while leading his men across “No-man’s-land”. 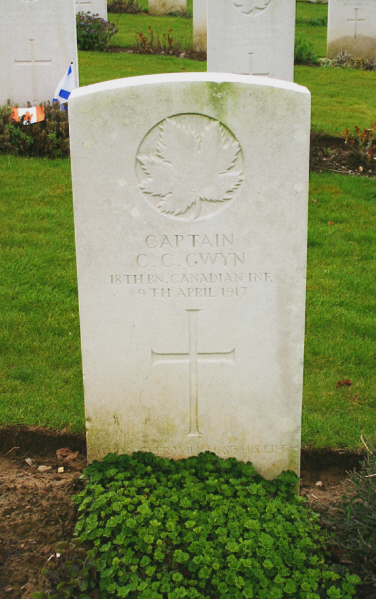 After the death of Major Gwyn, Lieut. P. Jerdan assumed Command of “B” Company. 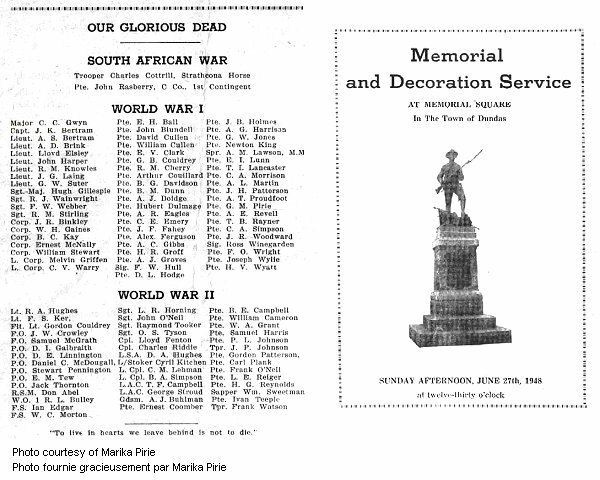 Attended Hillfield Strathallan College (high school) in Hamilton, Ontario and then was a member of the Alpha Delta Phi Society at McGill (1908). Born at Dundas, Ont., December 5th, 1885. 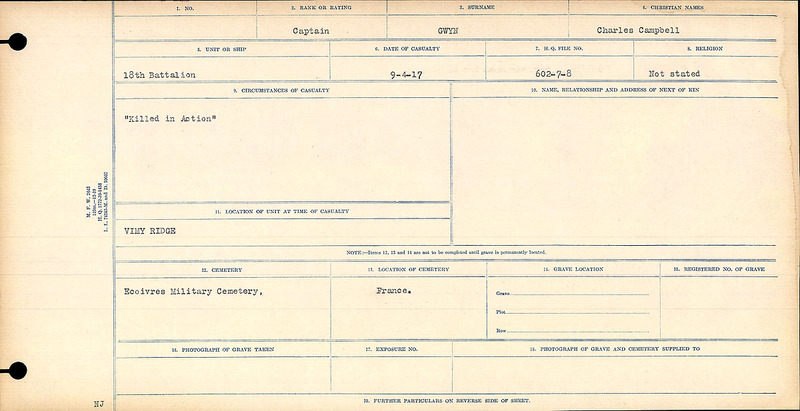 Enlisted, September 22nd, 1914, in the 1st Battalion, C.E.F. 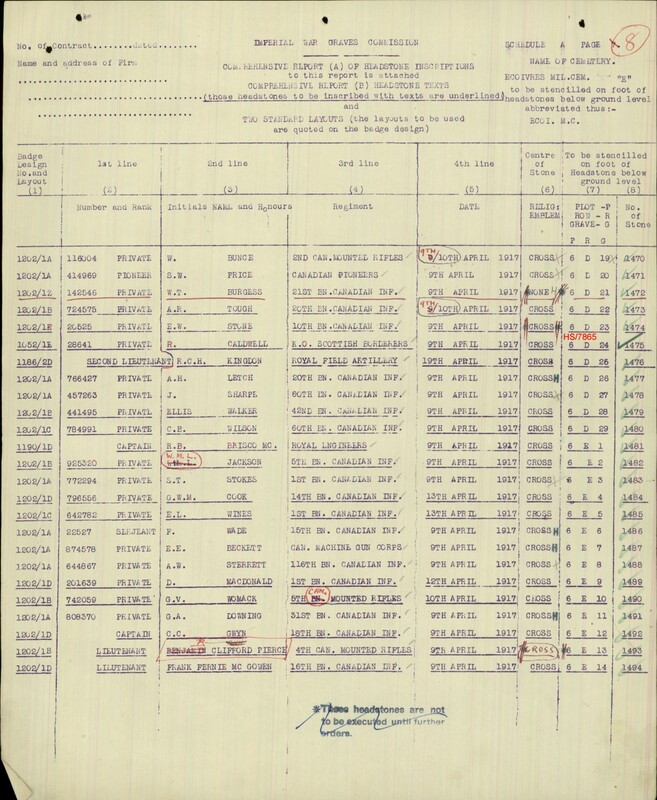 Transferred to the 18th Battalion. Promoted to Acting-Major. Served in France. Mentioned in Despatches [sic]. 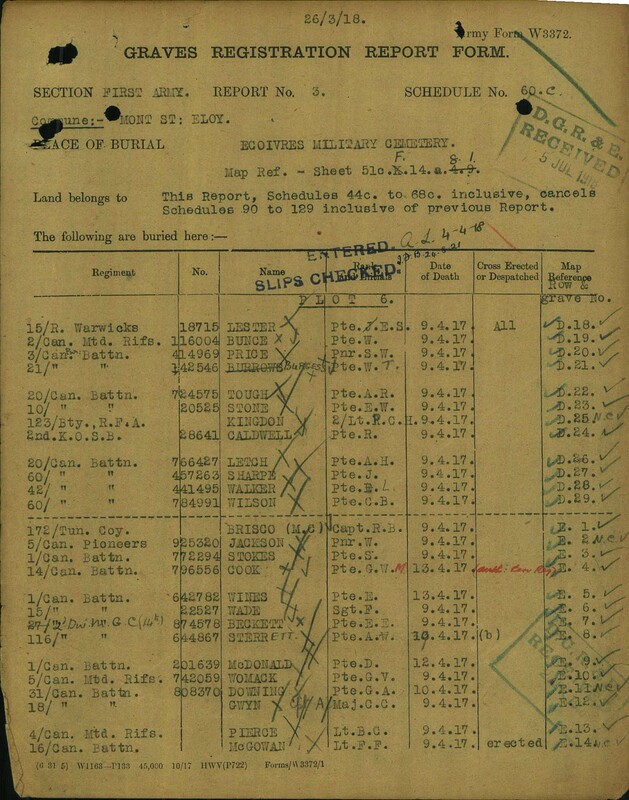 Killed in action, April 9, 1917. Photo by Marika Pirie via CVWM. 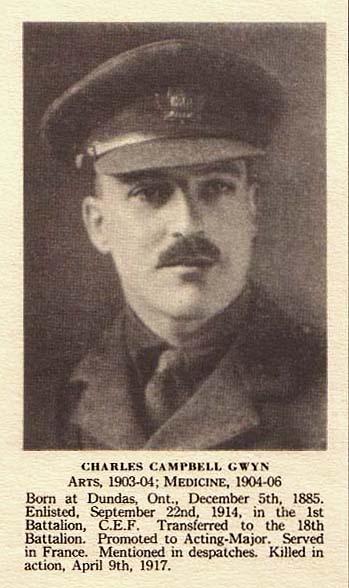 CAPT CHARLES CAMPBELL GWYN (Canadian Infantry), born December 5, 1884, was killed at Vimy Ridge on April 9, aged 32. Highfield School XI in 1902 – 3. Nephew of Sir William Osler. The Highfield Review obituary said: “Campbell Gwyn was on of the “Originals”, entering the School on its opening day, September 9th, 1901. 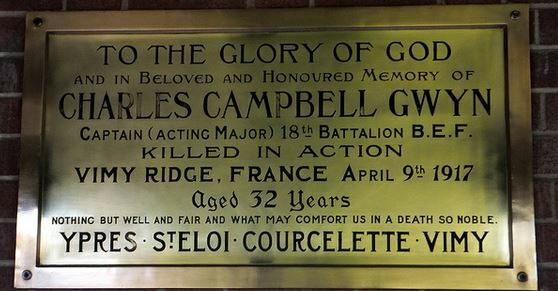 Seized with the terrible meaning of the struggle, he entered the 1st Batt as a private, doing noble service during the most arduous days of the war. 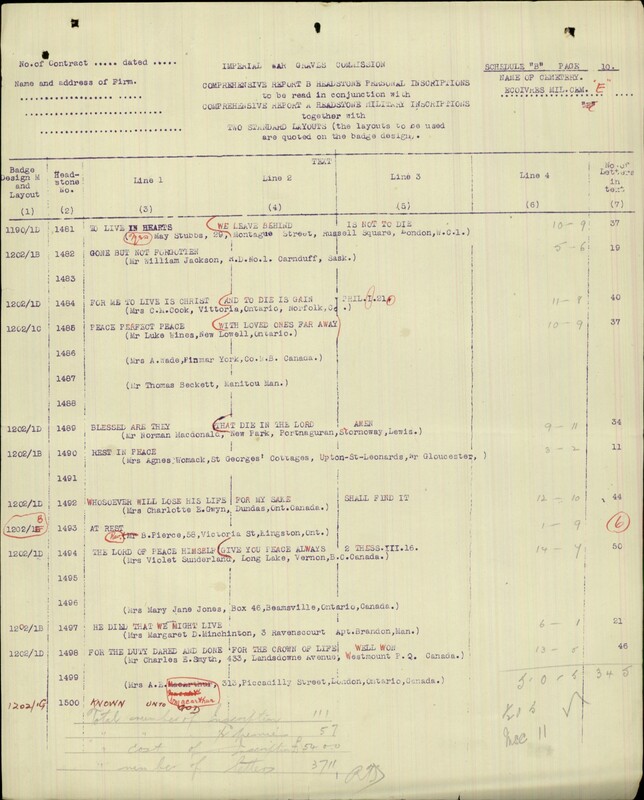 He was wounded, mentioned in Despatches [sic] and given a Commission. As an officer he was singularly beloved, as numerous letters testify. No handsomer solder or braver soul has found a resting place in the blood-stained fields of Flanders’. 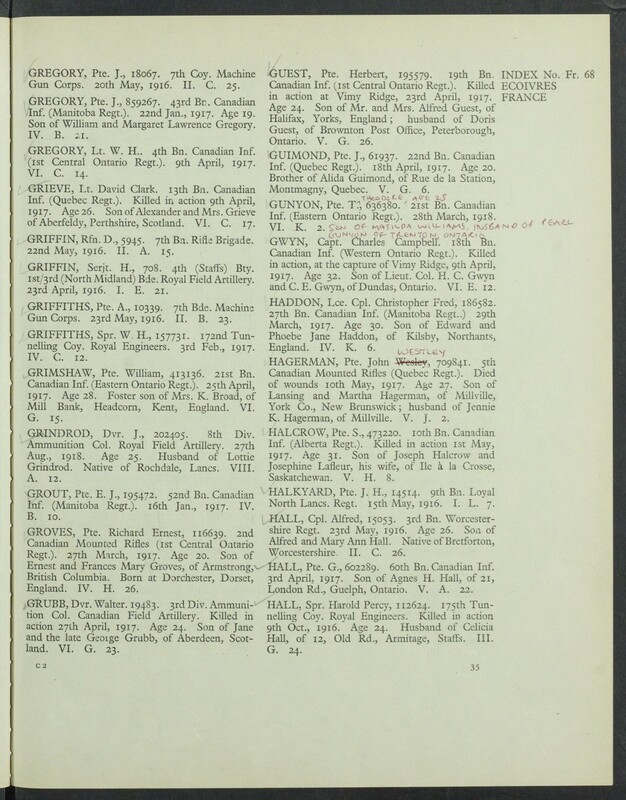 Son of Lt Col H C Gwyn of the 77th RHLI.